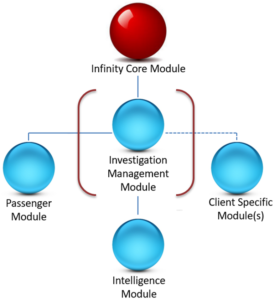 The Investigation Management Module is the case management component of Infinity. The module comprises an extensive, rich and diverse array of features and functionality, known as services. Select from the tabs below to view a summary of each of the services. The Target Management service focuses on data entry, consolidation, association and presentation. This service is composed of several sub-components used by Infinity to achieve a single, composite view of all information and intelligence associated with an entity. An Investigation can have zero, one or many Targets and attributes associated. As an Investigation is an entity onto itself, attributes can be added directly to an Investigation (document, pictures, tasks, scans etc). These Investigation attributes are automatically associated with all entities (eg Targets/Organisations) which have a relationship/association with the Investigation. Infinity brings reporting to the next level by enabling users to generate custom reports based on available tables and fields within the system, subject to a users security access rights and restrictions. User generated reports can be saved for personal use or shared with all users of the system. Infinity provides court record service, inclusive of court record creation, saving, editing, association, monitoring, alerting and querying. A court transcript viewer is also available if required. This service provides for the capturing, association, organisation, management, monitoring, movement and reporting of evidential items. The evidence tracker includes unique serial number and barcode creation, barcode scanning, evidence check-in/check-out etc. The Document Management service is a complete content management system that provides enterprise-grade security, easy administration and is seamlessly integrated with Infinity. The Document Management service allows users to create and manage any type of content, from MS office documents, scanned documents etc. all inside Infinity. Documents and other content can be associated with entities, maintaining an easily accessible process flow and retention. Infinity provides configurable security profiles to enforce the correct access control on content within the system. User and group permissions control who can read and who can modify documents. Version control tracks who changed which document and when, with full roll back to a previous version(s) if needed. The Closed Messaging service provides an internal messaging solution similar to modern email applications. This messaging system can be configured in two ways. 2.It can be configured to connect to external organisational email servers. In either scenario, the messaging system frontend is accessible through Infinity. The multi-media manager allows for the uploading and tagging of multi-media files such as audio, images or video. Thumbnail images are auto-created for all supported multi-media files. Multi-media files are searchable based on their file name and any tags/description associated with the file. Instant messaging (IM) allows users to communicate via a chat window within the application. User or system activity relating to Targets or Investigations are monitored and tracked. These activities are graphically displayed on a timeline within Infinity allowing for complete historical review of activity – who did what, when, where and how. Infinity includes a complete bespoke Tasking Service which is flexible, customizable and adaptable to the requirements of the client. Includes features such as; tracking, assigning, notifying, alerting, linking and reporting. The landing page of Infinity provides a comprehensive dashboard. The dashboard is an interactive screen designed to provide summary information and navigation portals through the use of widgets. The size, position, inclusion or exclusion of widgets are user configurable. Infinity is flexible in the types of dashboard widgets available and can range from graphical, tabular, chart or image based. Tasks, Alerts, Reports etc are all interconnected with a users calendar allowing for automatic entries, warnings, notifications etc. Infinity includes the ability to package and export all information relative to a Target or Investigation. Export options include documents, graphs, correspondence, chronology, multi-media and so on. This is of particular value for reasons of legal Discovery or audit. The Entity Relationship Diagramming Service (ERD) is a visualisation tool that enables users to automatically generate entity relationship diagrams from data derived from Infinity. The ERD also caters for manual data entry which is propagated back into the Infinity engine and made available to all users. All changes, additions/subtractions/connections etc created in the ERD are fed directly into Infinity and available immediately to all users. An ERD can be auto-built through a search, defining either a simple or complex search algorithm. The ERD is simple to use with features such as ‘drag and drop’, ‘scroll and zoom’, ‘click and type’. An entire investigation could theoretically be conducted directly from the ERD screen. Diagrams can also be saved, printed, exported etc.